Over 50 years ago Paddy Gill left the Irish Forces and with no jobs in his home town in County Carlow he came to New Barnet in England. He worked on building sites and after a 16 week qualification period, he got a house from the Development Corporation in Welwyn Garden City. Showing great energy he started out on his own as a general builder in the sixties with his wife Valerie as company secretary. Eventually he purchased a plumbing company next door to his existing premises renaming it Gill’s; it’s now run by his grandson Chris and daughter Lorraine. Grandson Alex has also joined the company. Chris has inherited his grandfather’s work ethic. When he took over as Managing Director they made big investments in premises, new people, range of products and a website. In 2005 Gill’s Plumbers Merchants also installed a Windows based computer system to help control the company’s growth. They needed computerised stock management, margin controls, product analysis and financial accounts which Lorraine runs. With entrepreneurial marketing, including a monthly customer newsletter, local advertising and a Facebook page, Gill’s now stock a wide range of plumbing and bathroom products in their trade counter from washers to full central heating systems. 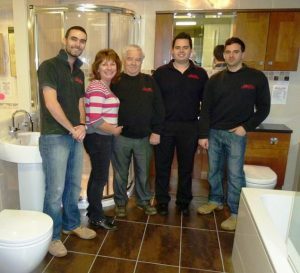 Their showroom illustrates aspects such as wetrooms, bathroom furniture and space saving equipment – their customer coffee machine works wonders. Gill’s Plumbers Merchants also run an installation department to take away the hassle of separately employing plumbers, tilers, electricians and plasterers – a one stop shop! After six years the management team who want the best in computer technology, changed their system. “The latest system, Sharp-aX gives us marked benefits over the old system with instant sales figures, system control rules, task managers and customer email shots. It is also future proof with modern relational database technology,” commented Chris. The company recently launched a new venture into kitchens and is still growing strongly and with their intelligence and hard work there is little doubt that it will continue to do so. What of Paddy? He is now 78 and continues to work, renovating a house every year; he takes an active interest in Gill’s and great pride in his descendants’ achievements.